THE BRILLUSTRATOR: Cowboys & Dinosaurs? My first chalking event! Being a member of The CLAW, which was started by a group of guys who met at a weekly chalking gathering, it is amazing and unusual for me to have never done a chalking project before. 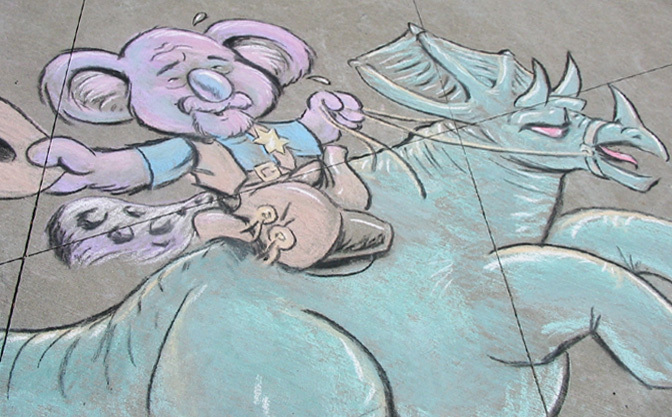 But this weekend I have finally managed to get to a chalking extravaganza (hosted by the Tacoma Art Museum, btw) and this is the image I managed to create over about 3 hours. It was a bit overly ambitious--I really should have started smaller, but it worked out OK in the end. And special thanks to fellow CLAW Talon, Mark Monlux for showing the ropes and giving me a ride to the event--and especially for the loan of the charcoal that made the piece pop! Also, sorry I've been abscent so long from blogging--family stuff and just life got in the way for a bit--but I'm back! Another note--this is probably the largest thing I have ever drawn. I usually work very small. A natural! 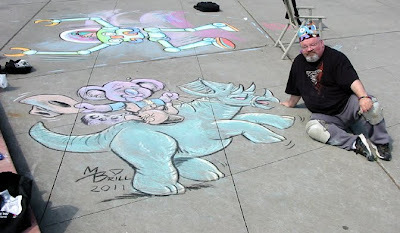 The world need more Brill Chalk Murals !